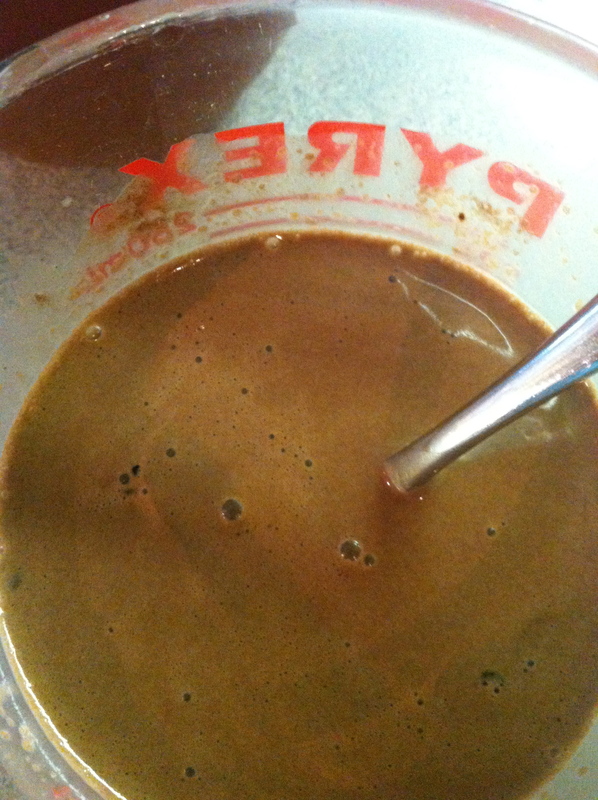 What are we imbibing since we swung over to the minimally-processed side of life? I’ll tell ya! There was some pushback from the boys about no soda when we went out to eat — it was just part of the specialness of the event for them (we don’t go out THAT much). So the first few times we gave in. But each time at least one of them would complain about having a stomach ache after going out — “maybe drinking something bubbly and sugary doesn’t sit that well with a belly full of sushi?” we asked, innocently. The 12 y.o. immediately decided that he wants to enjoy his food, so he no longer gets soda when we eat out. The younger boys were not so willing to just give it up. So we compromised — eat your dinner first and then you can order a soda for dessert (if you still want it). So far, by the time the meal is over, they have no interest in a soda. At home, it’s just no longer an option — there’s none in the house. The two older boys quickly adapted to either water or organic apple juice. And the youngest was placated once I made him his own special “cocktail” (unfortunately, I jokingly referred to is at his “cocktail” and that stuck — the babysitter was a bit shocked the first time he asked her to make him his “cocktail!). 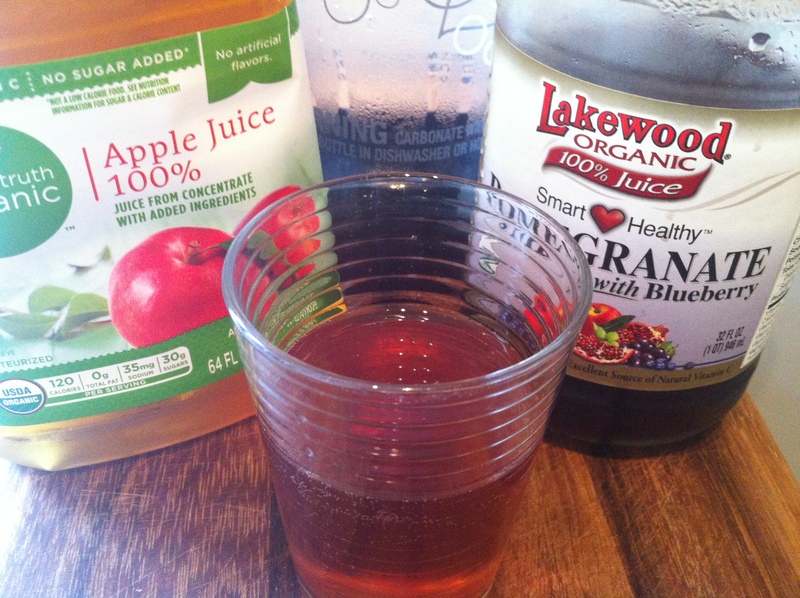 Here’s the recipe: a pour of unflavored sparkling water (made in our hardworking SodaStream), a spash or organic pomegranate/blueberry juice, a splash of apple juice. Et voila — le Maxi-Cocktail! This was actually the most difficult (and personally stressful) replacement to figure it out. For as long as he can remember, the 9 y.o. has had a cup of “warm choco” every morning. It’s like that first cup of coffee for most adults — his tried and true way to wake up (and he’s a bear if he doesn’t get it ASAP). So when he’d stumble into the kitchen in the AM, I’d microwave a cup of milk with 2 T. of Ovaltine in it. He’d toss it back and then be ready to face the world. And the 5 y.o. — while not as dependent — definitely enjoyed his own “warm choco” upon waking, as well. 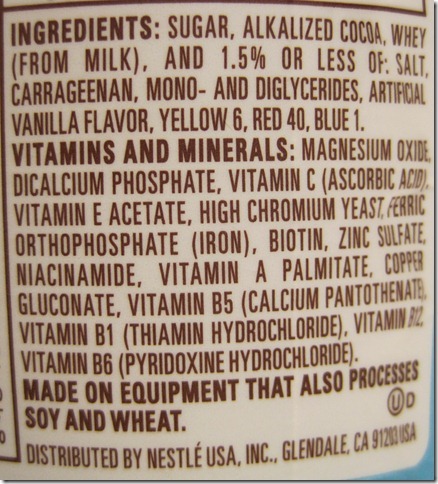 SO, I knew Ovaltine was probably pretty sugary (I avoided reading the label — ignorance is bliss). I focused on the words on the label that shout out that it’s a “good source” of vitamins and minerals. When I decided to get real with our food, I figured I’d better face the facts. Hmmm. That’s a lot of stuff that I don’t have floating around the pantry (one of our rules). And what’s with all the food coloring?! So, the “warm choco” replacement challenge was on. One afternoon (i.e., NOT during morning “I need my chocolate milk right now!” grumpy time), I sat the two youngsters down and told them we were doing a chocolate milk competition! 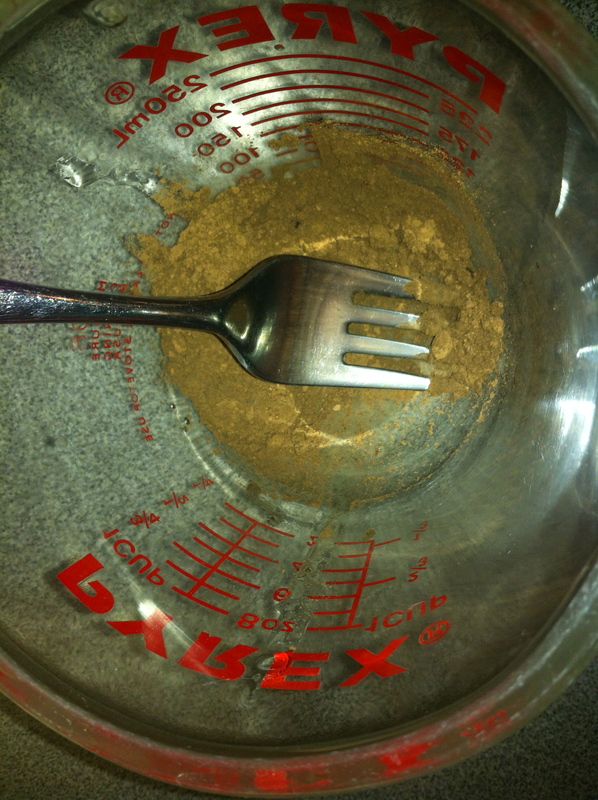 I’d whisked up cocoa powder with several different combinations (honey, maple syrup, or agave syrup, with or without vanilla extract). It was a lot of milk to go through, but the necessity of conquering this food item made it more than worth it, in my opinion. They quite seriously tasted each version, practically swishing and inhaling like wine connoisseurs…. And the winner was cocoa powder and maple syrup! Yay!!! Of course the next morning they immediately proclaimed, “We don’t like this as much as our old warm choco!” Mean mommy-face: “Well, it’s this or nothing.” Loving mommy-smile. They haven’t complained since. So I figured, if I’m just getting plain tea or coffee, I might as well just make it at home. So we do. We still buy a fair amount of Starbucks products, so I don’t feel they are suffering too much. I always start the day with 2 cups of English tea and milk downed in quick succession. I’m as bad as my 9 y.o. — except I think I’m going on at least 13 years of this way of waking up. Luckily, going “real food” didn’t change that routine. Huzzah. 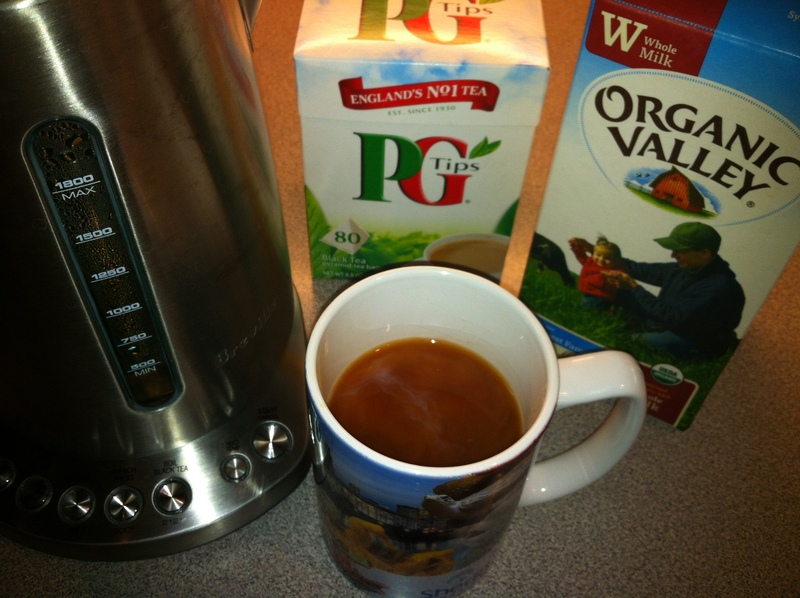 PG Tips, organic whole milk, my beloved Breville electric water kettle — lightning fast morning wake up treatment! I do like coffee mid-morning or mid-afternoon (which is when I would usually hit the coffee shop). And I’ve always hated dragging out the big old coffee maker just to make a couple of cups. Then I ran across this handy hint in an old Cooks Illustrated magazine (I love Cooks Illustrated!). 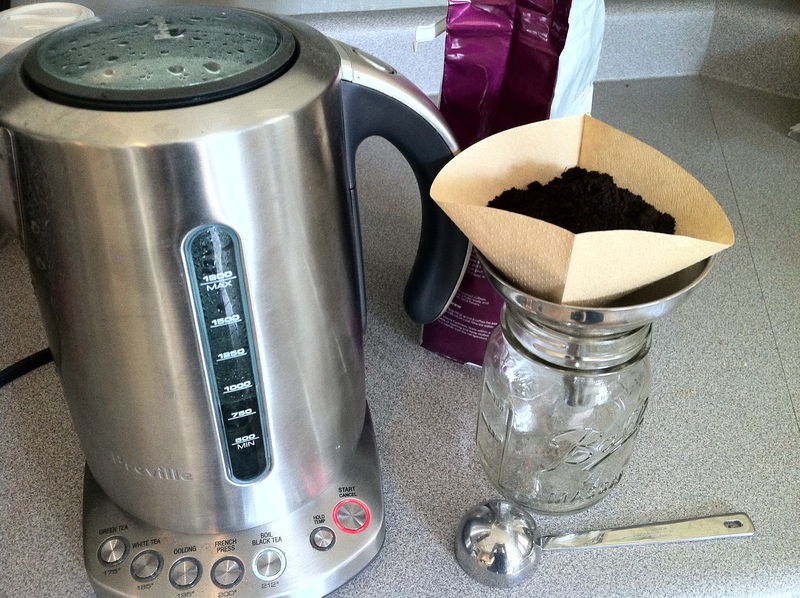 Brew a single cup of coffee by placing a funnel in your mug, put the filter and a couple of T of ground coffee in the filter, pour boiling water over that and get a freshly brewed cup of coffee for one. So I liked the simplicity of that; played around with the amounts and have developed this daily recipe for a jar of iced coffee: 4 T of ground coffee (Starbucks French Roast) to 12 oz of boiling water. 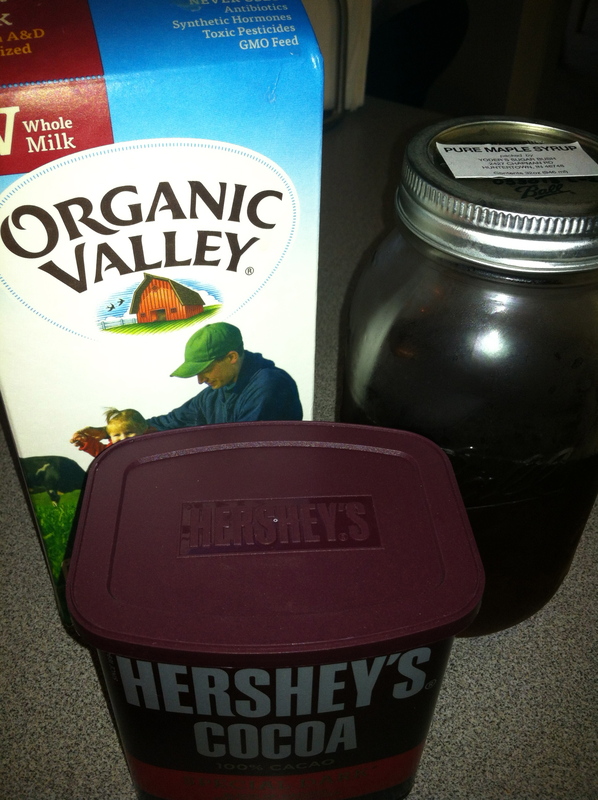 I keep the jar in the fridge and get 2-3 glasses (over ice, with organic half and half) per day. 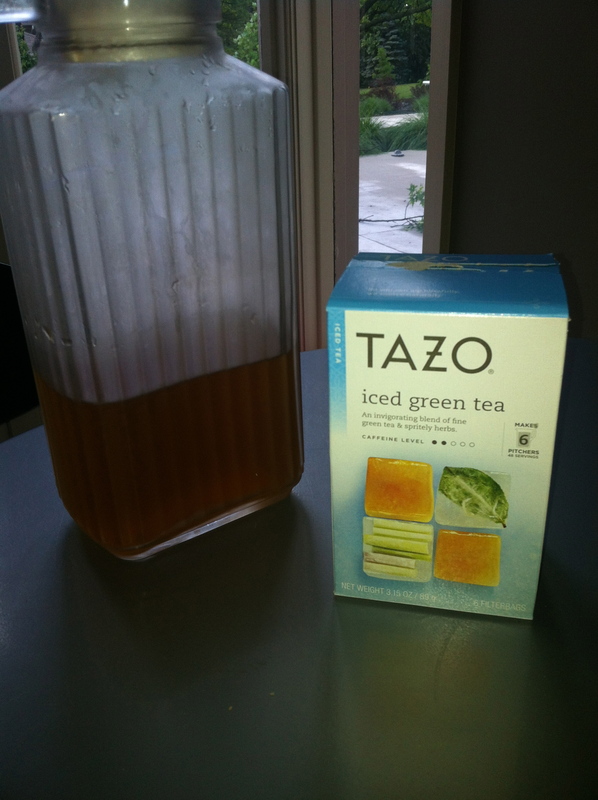 Bill is a HUGE Starbucks iced green tea (unsweetened) fan. Last summer he averaged at least two trips day for iced trentas (you know, that huge trough size?). But this summer, he realized that you can buy a box of their tea bags to make it at home. MUCH cheaper and cuts down on the driving. So he makes a pitcher every morning. (Man, our electric kettle gets a workout!). Is all this caffeine just a way to get me to…. Happy Hour starts pretty early in the summer around here. I needed to lighten up my evening glass(es) of wine. I like to feel relaxed, of course, but not TOO relaxed — there’s still dinner and boy bedtime to get through, afterall . So a splash of sparkling water (“spicy” water as our 5 y.o. 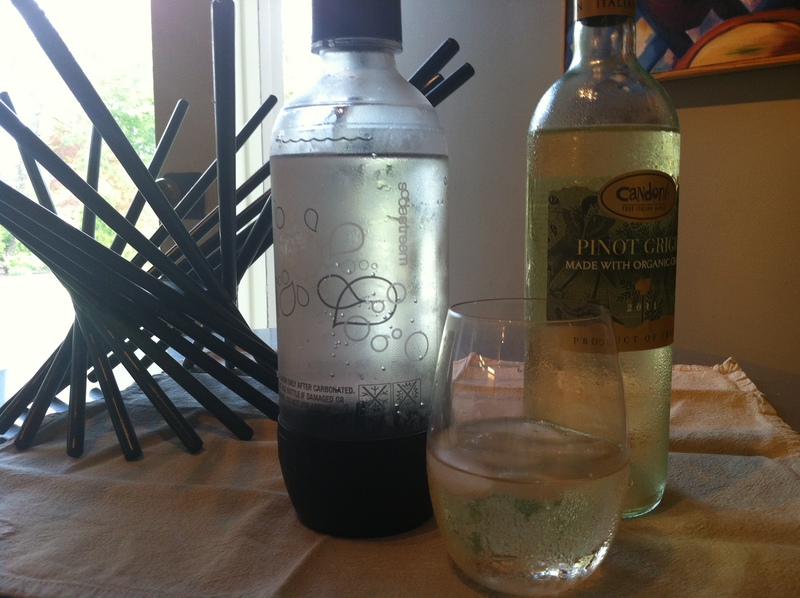 calls it), a pour of organic sauvignon blanc, ice cubes if I’m going to sit by the pool for a bit. The Spicy Nun! (“spicy” is thanks to the 5 y.o. ; but I can’t explain the nun part…. it just seemed like the thing to call it.) Salut! ← Day 35. So what? Pingback: Summer. Traveling adventures. | Real Food. Real Family. Real Midwest.